In this weeks reading from Parsahat Shoftim (Devarim / Deuteronomy 16:18-21:9), Moshe writes on the establishment of offices of administration, judges, and officers and the necessity for justice saying כ צֶדֶק צֶדֶק תִּרְדֹּף לְמַעַן תִּחְיֶה וְיָרַשְׁתָּ אֶת-הָאָרֶץ אֲשֶׁר-יְהוָֹה אֱלֹהֶיךָ נֹתֵן לָךְ: “16:20 ‘Justice, and only justice, you shall pursue, that you may live and possess the land which the Lord your God is giving you.” (NASB) To judge with justice is to judge righteously (מִשְׁפַּט-צֶדֶק) here justice is the act of righteousness (16:18-17:20). Moshe continues by describing the portion to be given to the children of Levi (18:1-8), he speaks about the nations and what they do is forbidden and detestable (18:9-14), and the cities of refuge are mentioned (19:1-22). In addition to this, we are not to move our neighbor’s landmark and to not bear false testimony (19:14-21). We are told what to do when going out to battle (20:1-20), and how to make atonement for a crime (21:1-9). In the midst of these instructions, Moshe declares that God will rise up another prophet, one whom the Lord God will place His Word in His mouth, one who stands as an intermediary on behalf of the people because of their fear of the fiery voice of the Almighty was more than they could endure (18:15-16). Based on this text, and the promise of a prophet like Moshe, there developed some measure of Messianic overtones based on these verses within the first century regarding the Messiah and who He will be (Devarim / Deuteronomy 18:15-22). 1. JUDGES AND OFFICERS WILL YOU MAKE THEE IN ALL YOUR GATES, WHICH THE LORD YOUR GOD GIVES YOU, TRIBE BY TRIBE; AND THEY WILL JUDGE THE PEOPLE WITH RIGHTEOUSNESS JUDGMENT (Devarim / Deuteronomy 16:18). Halachah: Is it permissible for a man’s near relative to act as judge in his suit? The Sages have taught thus, the following are regarded as near relatives, a man’s father and his brother, and both his paternal and maternal uncles, etc. Why so? Just as a relative is disqualified from giving evidence, so too is he disqualified from acting as judge. And what reason have you for saying so? R. Simeon son of Yohai said, It is written, And the priests that sons of Levi will come near, for them the Lord your God has chosen to minister unto Him, and to bless in the name of the Lord; and according to their word will every controversy and every stroke be (Devarim / Deuteronomy 21:5). Come and see. Scripture has compared controversies with strokes, and strokes with controversies, in order to tell you that just as strokes can only be adjudged by day, so too, suits can only be tried by day, and just as from controversies near relatives adjudging are excluded, so too, are they excluded from strokes. R. Simeon son of Gamliel said, Do not make mock of justice, for it is one of the three feet of the world. Why? For the Sages have taught, On three things the world rests, on Justice, on Truth, and on Peace. Know then full well that if you wrest judgment, you shake the world, for it is one of its pillars. The Rabbis say, Great is the power of Justice, for it is one of the feet of the Throne of Glory. Whence is this? For it is said, Righteousness and justice are the foundation of Your throne; mercy and truth go before You (Tehillim / Psalms 89:15) God said, Since the punishment for wresting judgment is so sever, take great heed. Whence is this? From what we have read in the context, JUDGE AND OFFICERS, etc. The rabbis begin with a discussion on how justice can be perverted if one’s relatives are in charge acting as a judge or officer. One should be careful not to pervert justice and do not make a mock of justice in this way because it is evil in God’s eyes. The midrash says that justice, truth, and peace are so important that these are the three things the world rests upon. If one of these three are withheld, the world would be shaken. The strength of this statement is illustrated by justice being at the feet of the Throne of Glory, righteousness and justice are the foundation stones of God’s mercy and truth. The Scriptures and the rabbis appear to be directing our understanding of these concepts within the context of bringing another prophet, one who is greater than Moshe. The Scriptures tell us that if a man will not listen to God’s voice, if a man does not listen to the words in the Torah, God says “I myself will require it of him” (יט וְהָיָה הָאִישׁ אֲשֶׁר לֹא-יִשְׁמַע אֶל-דְּבָרַי אֲשֶׁר יְדַבֵּר בִּשְׁמִי אָנֹכִי אֶדְרשׁ מֵעִמּוֹ:). The Aramaic Targum states, “My Word (Memra) will require it of him” (יט וִיהֵי גַּבְרָא דִּי לָא יְקַבֵּל לְפִתְגָּמַי דִּי יְמַלֵּל בִּשְׁמִי מֵימְרִי יִתְבַּע מִנֵּהּ:). It appears the Lord is saying that if you do not believe My word, then My word will require it of you, which may be a reference to payment for sins. King David said in Tehillim / Psalms 49:8, ט וְיֵקַר פִּדְיוֹן נַפְשָׁם וְחָדַל לְעוֹלָם: 49:8 For the redemption of his soul is costly, And he should cease trying forever. (NASB) This suggests that there are those who seek to redeem their own souls by the work of their own hands. It could be that the wicked who boast in their riches (see Tehillim / Psalms 48, compare both the Hebrew and Aramaic Targums) believe it is possible to deliver themselves by their own hands. Note how the Targum states 49:8 A man will by no means redeem his brother, who was taken captive, by his riches; and he will not give to God his price of redemption. (EMC) The rabbis who translated the Targum do not appear to be thinking on the salvation of the soul when David says “the redemption of the soul is costly.” It appears in the psalm that the wicked man is held captive by his own wealth and that it is impossible to redeem one from this kind of captivity. A man is unable to rescue another from his (personal) riches, or that one is not able to save from the grave, he could not by his wealth preserve him in life. 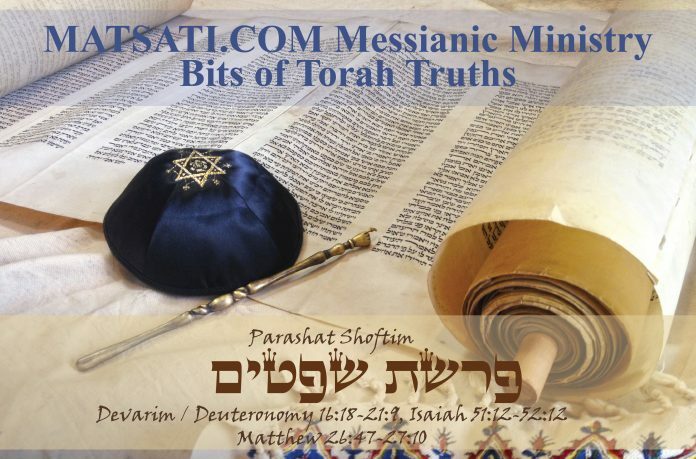 The point of the psalm and the Torah portion is to show how powerless and valueless is wealth in regard to the things that are most important to a man’s welfare, life, and even his own soul before God. We seek the Lord and we believe His word and by faith we live our lives accordingly. The parable or riddle that David speaks of in Tehillim / Psalms 48 is with regard to the wicked who follow their own folly and do not follow the wisdom of God that is found in the Scriptures, God’s Word itself. The people interpreted these Scriptures in Devarim / Deuteronomy 18 in the 1st century period as referring to the Lord raising up a prophet and according to the gospel of John, the people questioned whether John the Baptist was the messiah promised by Moshe. They wanted to know His identity. When the priests and Levites come they asked John whether he was the prophet that was to come as it was written of Moshe in the Torah. John responded saying “I am not the Messiah.” John goes to say that he is the one that prepares the way, “makes straight the way” as it is written in Isaiah 40:3. It is interesting that the priests and the Pharisees then ask John “why do you baptize if you are not the Messiah, Eliyahu (Elijah), or the Prophet?” The understanding of the priests and Pharisees on the Prophet whom God was going to rise up according these scriptures from Devarim / Deuteronomy 18:15-22, the Messiah would be the one who would perform the mikvah for the people, directing to repentance and to turn their lives in a new direction, to the way of the Lord. In the 1st century, the priests, Pharisees, and the disciples of Yeshua understood Devarim / Deuteronomy 18:15-22 to be predicting the coming of the Messiah. In Acts 3:22-23, the apostle Peter states that this prophet is none other than Yeshua the Messiah.